Life Technologies offers more than 1,000,000 TaqMan Gene Expression Assays, the most comprehensive set of predesigned Real-Time PCR assays available. All TaqMan® Gene Expression Assays have been designed through a validated bioinformatics pipeline, and run with the same PCR conditions, eliminating the need to design primers or optimize PCR conditions. There are more than 1,200,000 TaqMan Gene Expression Assays available from 19 species. 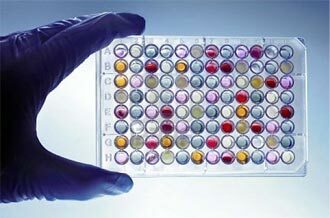 TaqMan® Gene Expression Assays were used as the gold standard in the MicroArray Quality Control (MAQC) Project, which compared data from seven microarray platforms (Nature Biotechnology, September 2006). 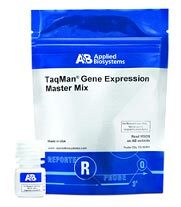 TaqMan Gene Expression Assays have the highest specificity, greatest sensitivity, and largest dynamic range of any gene expression technology. For more information regarding TaqMan Gene Expression Assays, or to design a project with the CGF, please contact Christin Sciulli. Explore the available TaqMan assays that can be run in the CGF. The Windows-based ABI Prism 7900 HT Systems use Peltier-based thermal cycling, TaqMan chemistry, and extended-life 488 nm argon-ion laser excitation to detect and quantitate nucleic acid sequences. interchangeable thermal cycling block formats let you select the format that is right for your project, using industry-standard 96- and 384-well formats, as well as a novel 384-well TaqMan® Low Density Array and a new Fast 96-well block that reduces run times from 2 hours to about 30 minutes. An easy automation upgrade path lets you add features to meet throughput demands. A Fast PCR option reduces run times from 2 hours to about 30 minutes. This technology is very sensitive in that it is able to detect single copies of genes and requires very little starting material. The system monitors PCR at each cycle of a reaction, and estimates the cycle when the reaction reaches log phase increments (when the most useful quantitative information about the sample is available). Quantitation can be “relative” to an internal standard such as a housekeeping gene, or “absolute” when compared to a standard curve generated from known concentrations. RT-PCR can be performed using a dual-labeled sequence-specific probe that carries both exciter and quencher tags. The exciter is cleaved from the quencher by the exonuclease activity of Taq polymerase and detected by the fluorometer. Another method of detection employs Sybr green detection. This method is less expensive and no sequence specific probe is required. Sybr green intercalates with double-stranded DNA and fluoresces as the PCR products are formed. This is detected and quantitated by the software.